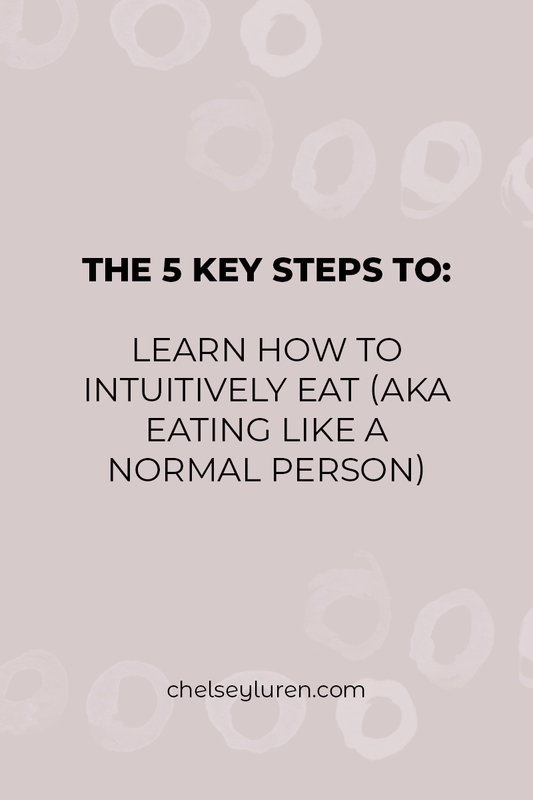 How to Intuitively Eat - by Chelsey Luren — Chelsey Luren Co. So many women - especially those who’ve operated from a place dysfunction, or even disordered relationship with food - have only ever known guilt + shame about what they’re eating, counting calories, and the constant desperate search for the next miracle diet. As a society, we’ve grown so used to controlling our bodies, beat ourselves into submission, wondering why we don’t have more willpower, and trying to hate ourselves into being some definition of ‘perfect’ that was handed down to us somewhere along the lines. We’ve backed ourselves into a corner with an emotional issue that we are trying to solve with data. Trying to logic our way out of an emotional issue is exhausting, and more than that - it doesn’t works. Because if it did, don’t you think we’d have figured it out by now? How has it been working for you so far? I see you, I hear you, and I empathize. And I get it - I lived with anorexia for 12 years before entering treatment. My life was ruled by the scale, what I ate, and the size of my jeans. I had no idea how to ‘eat like a normal person’, or what that even meant. If you are struggling with an eating disorder, there is help - and I’m living proof of how effective it is. Get yourself professional help, and a treatment plan. You cannot do this alone, and you don’t have to. Talk to your doctor, and there are awesome resources here, here, and here for you. and instead a matter of being. Huh? What the hell are you talking about Chelsey? Or anything within this same vein of control, fear, or self manipulation. Intuition is based on trust. It’s dependant on trust of our body, our emotions, and knowing that we can handle any emotion that comes our way - because the only way we have access to our intuition is by feeling our feelings fully. Our intuition is the feeling sensations that come up in our body, and honouring them based on the feedback they give us. When we eat with our intuition, we make decisions about what to eat, when we eat, and how much to each based on the sensations our body gives us. The call to honour those cues deepens our self trust; believing that our body knows what’s best for us. It’s a choice to honour our needs, desires, to nourish, and nurture ourselves from a place of love. The only way to be receiving these signals from our bodies (AKA our intuition), is by feeling our feelings. And here’s the thing, we can’t selectively feel our emotions. To feel the positive emotions, we must feel the low vibe emotions. To numb one emotion, is to numb all. When we go on diet after diet, controlling our food, manipulating our bodies, restricting, punishing with exercise, hating ourselves based on appearance - all of this is rooted in fear. All of it slowly erodes away at our self trust. Just as we cannot create self love from a place of hate , we cannot access our intuition from a place of fear. If you want to learn more about the concept of why creating self love is not possible from a place of punishment, deprivation, or self hate, I dive into this concept a ton in this blog post here. We get hung up on the ‘how’ when it comes to intuitive eating. But here’s the thing, our intuition has nothing to do with the ‘how’. By nature of it, it is not about the ‘how, intuition is about feeling our feelings and listening to what our bodies tell us (ie. The feeling sensations it gives you). So in order to intuitively eat, we must be willing to feel. To regain the wisdom of our bodies (and in turn be able to intuitively eat), we must reconnect with our feelings. There’s nothing to do, it’s simply about feeling and learning how to actually feel your emotions again. Being in your body, feeling your emotions, and honouring what they’re communicating to you. But that’s not what you’re going to hear from the diet industry because how can they sell you diet pills, supplements, pharmaceuticals, and exercise regimes if they do? It’s not the feelings that have landed you in hot water. It’s that you’ve ignored them, pushed them down, and been running away with everything you’ve got. Instead of accepting the emotions for what they truly are (feedback), you made meaning about what the feelings are. Maybe you’ve tied your worth to what you feel. Or have been told certain emotions were bad and felt shame. Or maybe you had trauma that felt too intense at the time. Regardless of your story, the way to change the way things is not found in numbing it all away. In order to intuitively eat, you have to listen to your intuition. Which means getting out of your head, and back into your body. This isn’t about a checklist, or finding the right diet, it’s about feeling your feelings, and honouring what they’re communicating to you. Presence: Becoming deeply aware of what you believe, think, feel about food, your body, and your emotions. So begin getting deeply present in this moment, aware of what is true for you, and noticing what comes up for you. Curiosity: Ask yourself about the reasons why you believe, think and feel the way you do about your body, food and emotions. What are the foundations of your reasons? Accept + Neutralize: When we finally know what it is that’s going on in our minds, we need to come to a place of neutrality. Accept things as they are - we can’t change from a place of hate or denial. Gratitude: Whatever has been your truth, behaviour or the results you’ve been getting until now - thank every single aspect for having kept you safe. All of it was done in hopes of keeping you alive; and it has. It served you until now, so choose to have gratitude for it. Reconnect: When you are present, have accepted where you are and have gratitude for it, from this place you have deep access to the emotions in your body. From this place of love, you are able to ask your body what it needs, hear what it tells you and take action based on what it communicates to you. When your body tells you what you want to eat, this is your call to rebuild trust, and honour it. Your intuition is never wrong about what is best for your heart and soul. ie. It will only ever tell you to eat what, when, and the amount that is best for the best version of you. Our bodies will never tell us to eat 10 bags of candy, a box of cookies and then polish it off with a litre of coke. That is what our mind is telling us - not our bodies. Your intuition is the information that gets dropped in from your most vibrant, fulfilled, authentic, Soul Level Self. It shows you what is the right decision based on your fullest potential. When you listen to your intuition, live in line with it, and do what is actually right for you - not the stories your mind makes up of "should" - you can't fail. Any outcome that doesn’t match who/what/where/when we think we “should”be is simply a matter of redirection, and letting go of what isn't actually serving you. Food is not the enemy. Your body is not the enemy. Feelings are not the enemy. The key to intuitive eating is getting out of your head, into your body, and reconnecting with yourself. So the question is, are you ready to reclaim your life? Because that’s what this journey of intuitive eating and healing our relationship with our body + food is - a reclamation. If you are, I would love to guide you and support you along the way. Head here to claim your free 30 minute call with me now. I can’t wait to personally connect with you!